The Wars of the Roses (1453-1485) were the result of the struggle for the English crown between the Houses of Lancaster and York … both descended from the Plantagenet line … both with equal claim to the throne. By the end of the bloody struggle, both houses would be extinct and the crown grasped by the first of the Tudors. 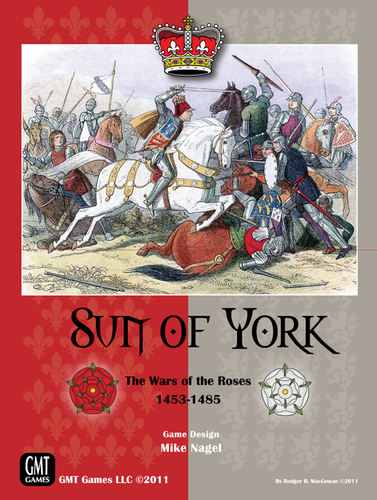 Sun of York is a card game depicting the tactical battles fought between these two royal houses. Represented by the cards are all the day's major leaders, including King Henry VI (too weak a leader to maintain control of the kingdom), Margaret of Anjou (Henry's strong-willed and manipulative queen), King Edward IV (organizational genius and longest holder of the Crown), King Richard III (charismatic leader of questionable morals) and Richard Neville, Earl of Warwick (the "King Maker"). Each Leader is rated for combat ability and his affect on the morale of the troops he leads. Troop cards include foot soldiers, missile units, pole arms and cavalry, all of different types and qualities, including mercenaries from the Continent. Each troop card is rated for its cohesion (the amount of damage it can sustain as well as deal out), its ability to move around the battlefield, and its combat quality. A variety of terrain cards are included, and are used to configure the battlefield prior to play. "Special" cards are included to provide period flavor and enable results so prevalent during a period where great heroics and insidious backstabbing by allies were common. The heart of the game system (and that which separates it from similar games) is its "Orders" system. Generally, leaders on the battlefield give orders to the units under their command. Units without leaders can only move through the play of Orders cards (unused Leader, Terrain and Special cards). Calling up reinforcements also requires the play of Orders. Often, players will have to make the choice between discarding excellent troops in order to get any kind of troop into battle before their line collapses. This simulates wonderfully the chaotic melees these battles often became, and the difficulty the commanders had in retaining control of their forces once they engaged. All the major (and several minor) engagements are included in Sun of York, as well as a random setup, for a total of twenty scenarios! Also included is a campaign system allowing players to fight out the Wars, one battle at a time, to their bloody conclusion.